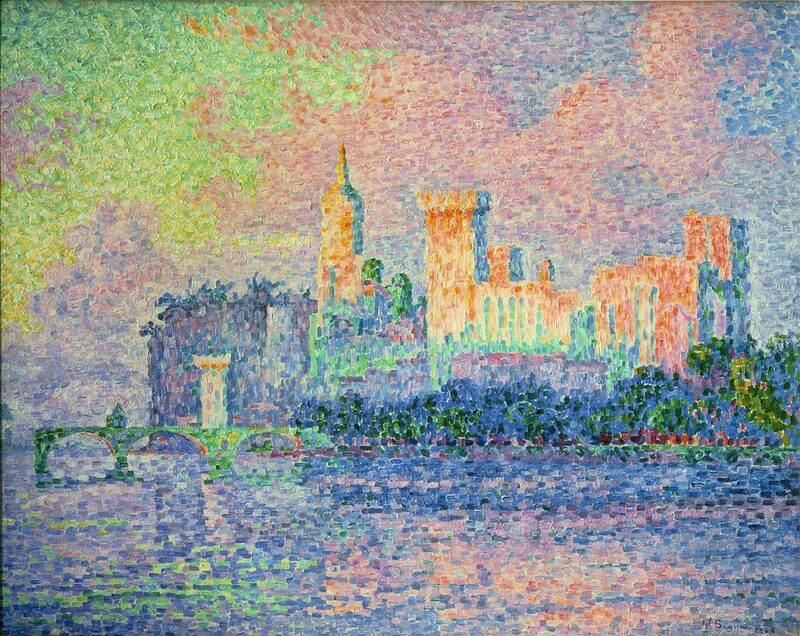 Signac’s style developed over time from the closely structured pointillism of the late 1880s and early 1890s, to a freer divisionist technique employing larger brushstrokes to achieve a shimmering, shifting, mesmeric surface. Palais des Papes, Avignon is the product of this later style, possibly one of a number of paintings completed in 1909 depicting famous buildings seen from the sea or adjoining river (the others included views of Genoa, Venice and Istanbul). Part of a longer term project depicting famous ports (visited on cruises in his yacht – he was a very keen sailor), this was the first of Signac’s oil paintings to be purchased by the state, entering the French national collection in 1912. Two versions of the scene exist, one shows the château just after dawn, but this painting gives us a dazzling evocation of evening light playing on the venerable residence of the Avignon popes. Unlike early pointillist output which used small points of paint, here Signac’s brush strokes have become much larger giving a more fractured surface, each stroke like the tesserae of the ancient mosaics he greatly admired. But the picture is nevertheless underpinned by the theories of Neo-Impressionism, the careful arrangement of complementary colour creating a scintillating luminosity. Signac welcomed a number of artists to his house St Tropez including Henri Matisse who, after his visit there in 1904 produced his enchanting divisionist masterpiece Luxe, Calme et Volupté. Matisse’s involvement with Neo-Impressionism was short but it proved to be a vital stepping stone in his journey towards Fauvism and beyond. Signac remained loyal to the tenets of Neo-Impressionism for the rest of his life.